Challah and Cherry Blossoms: And Finally, the Fourth Challah Cover complete! As we are nearing the end of the Fifth book of Torah, I have finally completed my Fourth Challah Cover! It is time to start on the fifth quickly, so without further ado, I will just share some of the photos of the fourth, and hope you enjoy how it came out. It surprised me how playfully the pink cloud of Cherry Blossoms above Mt. Fuji echoes the shape of the Challah! Also how the mountain becomes voluminous when it covers the Challah. Can you see how the elements come alive when the challah cover does its job of covering the Challah!! 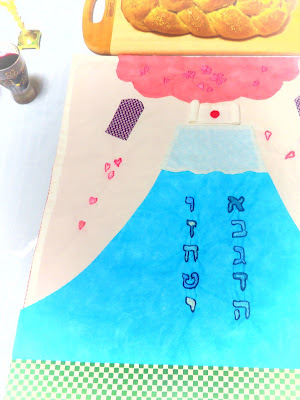 The `Torah` on top of Mt. Fuji can be seen in this photo below, as well as bits of fabrics in Japanese patterns that are used in places on the front and back. The islands will wait for His Torah. The first ten letters of the Hebrew alphabet, representing the Ten Commandments, are embroidered onto the shape of Mt. Fuji. It surprised me how playfully the pink cloud of Cherry Blossoms above Mt. Fuji echoes the shape of the Challah! Views of a Challah Cover, above `Flat and extending over the Shabbat Table`, and as it drapes over the Challah....Shabbat Shalom from Japan! God Bless you and Shabbat Shalom! *Note: Extra special thanks to K-san, who some readers may recall meeting through my Postcard Challenges!! It was her inspiration on this Postcard Challenge post HERE that gave me the ideas for this Challah Cover, including the idea of the Pink Cherry Blossom cloud, and the use of the Japanese pattern fabrics, so it really became a collaboration. Thank you K-san! Your love for Mt. Fuji and the Shabbath challa is very touching! Lovely challa cover!